A good English “Mortuary” hilted back sword dating to the middle part of the 17th century. 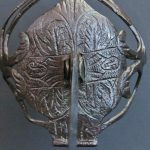 The hilt is of typical form consisting of a broad saucer-shaped guard plate from which three main guard bars extend upwards with the flattened terminals screwed into the pommel. The spaces between these bars are infilled with subsidiary bars and scrolls. The back sword blade has a short ricasso after which a single broad fuller extends to the tip. The blade is double edged for the last 9 inches (23 cm). A blade maker’s mark resembling a human head facing to the left is stamped either side in the middle of the ricasso flanked by pairs of vertically incised lines. A pattern of flowers and foliage is finely incised in a scroll either side of the blade commencing from just beyond the end of the ricasso for 7 inches (18 cm). The guard plate is covered with chiselled decoration to the outside consisting of panels of foliage and ferns plus two busts either side of the blade. 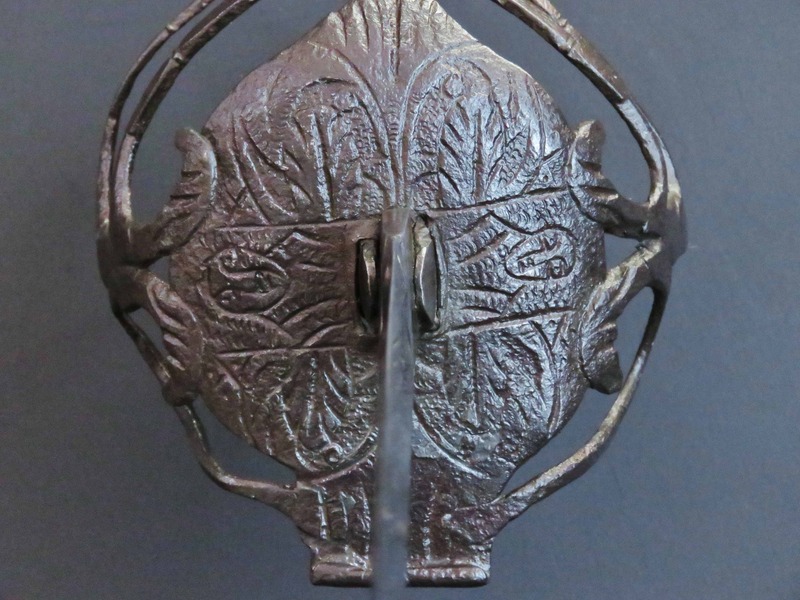 The guard bars and pommel are decorated with chiselled lines in a fern-like manner. A curled, grooved, wrist guard is fashioned from the rear of the plate. The pommel is globular in shape and has an integral button and a pronounced flared neck. The wooden grip is wrapped with leather, thinned with age, and vertically bound with twisted and flattened bands of copper wire. It sits on an iron flanged plug mounted onto the inside of the guard plate from which two langets extend through the tang aperture to flank the blade below on either side for a short distance from the hilt. The sword is in good condition with some minor blackened age related stains . The blade is 34 inches long (87 cm) and overall the sword measures 40.25 inches (just over 102 cm) long. For a further discussion on Mortuary swords see Cyril Mazansky, British Basket Hilted Swords, Boydell Press 2005, Chapter 11, page 233 to 280. 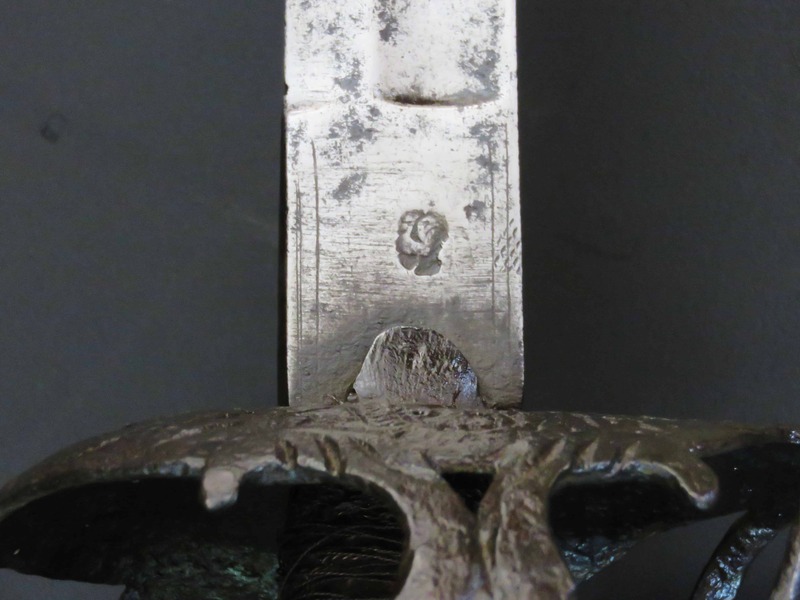 Our sword hilt corresponds to Type ii and the engraving is similar to sword reference IICii, in the National Army Museum, illustrated on page 257. The sword hilt is also particularly like that illustrated on page 217 of “British Military Swords”, Stuart C Mowbray, Mowbray Publishing, 2013, in the York Castle Museum Collection. 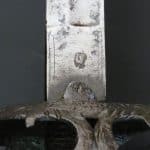 The similarities between the engraved patterns to the hilts of these swords may indicate a sub-group within the overall “Mortuary” category, or the signature design of a particular maker or workshop, now unknown. The blade features and the style of the armourers marks in the fullers is also very similar.